Insurers frequently have reinsurance for some incomplete subset of the potential claims against them. A problem arises when the insurers become insolvent. Ordinarily, the proceeds of the reinsurance belong to the insurer and are supposed to be distributed according to the priorities set by insurer insolvency laws. Moreover, at least in most American jurisdictions, as a result of laws governing the accounting treatment of reinsurance, contracts governing reinsurance prohibit the reinsurer from directly conditioning its obligation to the insurer on the solvency of the insurer (otherwise, both the reinsurer and insurer might want to eliminate the liability). If, however, the reinsurer can directly negotiate with the reinsured claimants and "cut-through" the insolvency proceedings, the reinsurer can pay less than it otherwise would, and the reinsured claimant can get more than he or she would in the insolvency proceedings. The loser in what amounts to a zero-sum game is the unreinsured claimant. This Demonstration shows how cut-through works. You set the assets of the insurer, the size of the reinsured claim, the size of the unreinsured claim, and the limits of reinsurance. 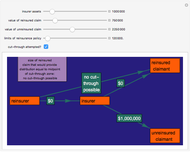 The Demonstration shows how the cash flows going to the insurer, the reinsured claimant and the unireinsured claimant. You can then permit cut-through and see the acceptable zone of payments the reinsurer could make to the reinsured claimant in exchange for a release of the reinsured's claim against the insurer. 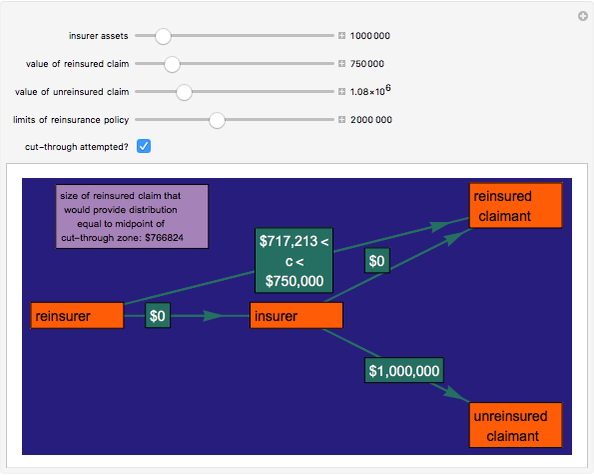 An inset box in the top left of the Demonstration shows the size of the claim the reinsured claimant would need to have to do as well without cut-through as it does with cut-through. "As well" in this context means a payment equal to the mean value of the cut-through zone. Some jurisdictions and courts make cut-through unlawful for precisely the reasons suggested in this Demonstration. From one perspective, it subverts the insurer insolvency distribution scheme. If parties know about cut-through in advance, however, it is not clear that cut-through is inequitable. The reinsurance described here is assumed to be first dollar reinsurance. There are many other kinds of reinsurance. Their inclusion in this Demonstration, however, would not alter the basic issue explored here. Snapshot 1: cut-through will not be profitable for the reinsurer under some circumstances even if the insurer is insolvent. 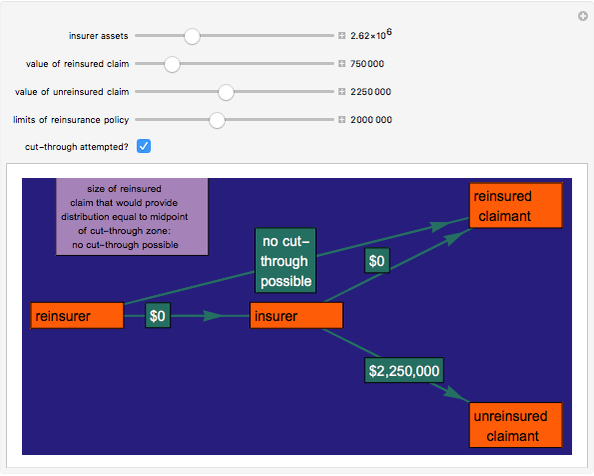 Snapshot 2: cut-through will not be profitable for the reinsured claimant if the amount of reinsurance is too low. Snapshot 3: having a larger unreinsured claim may actually increase the minimum amount the reinsured claimant will receive after cut-through. Seth J. Chandler "Reinsurance Cut-Through"